Can a 2.5 pound digital pedal really re-create one of music's most recognizable mechanical beasts? Neo Instruments attempts to digitize the famous Leslie 122 speaker and organissimo's Jim Alfredson reviews the results. The Leslie speaker is one of those ideas that perfectly straddles the line between pure genius and pure insanity. The concept is brilliantly simple: Take an ordinary speaker and figure out a way to make it spin in order to liven up the stale tones of the earliest electric organs. The manifestation of the idea is beautiful: A huge wooden cabinet, a wurring upper rotor that looks like two gramophone horns on a Lazy Susan, and a massive wooden lower rotor that slowly lumbers up to speed. The effect is instantly recognizable: Stationary sound seems to spring into motion, bouncing off every surface in the room, causing a complex Doppler-like interaction with the acoustic environment. The boring electric organ suddenly comes alive! It's no surprise that soon after Don Leslie's eponymous invention arrived in 1941, the Leslie speaker irrevocably paired itself with the electric organ, specifically Hammond 's electromechanical tonewheel organs, including the famous model B3. If you hear organ on a modern recording, chances are it's a Hammond through a Leslie. It's also no surprise that our miniaturized modern world demands something that sounds exactly like a Leslie speaker but without the bulky size and weight. In the last few years, amazing leaps in digital emulation technology have all but replaced the old mammoth tonewheel organs, at least on stage. But emulating the Leslie has proven to be a bit more problematic. Products have come and gone but nothing has hit the bullseye yet. The newest “rotary cabinet simulator” to hit the scene is from a German company called Neo Instruments. 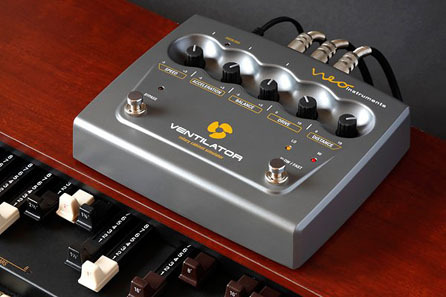 Named the Ventilator, it's a digital effects pedal that aims to faithfully re-create the sound of the classic Leslie 122 cabinet, including its legendary tube overdrive, as if it were mic'd with a stereo pair of microphones on the top rotor and a single mic on the bottom rotor. A tall order for sure. What's the real spin on the Ventilator? The Ventilator arrived very quickly, shipping direct from Germany via Air Mail Express. Upon lifting the unit from the box, I was immediately impressed by the weight and build quality. The chassis is die-cast aluminum, the high quality 1/4” jacks on the back are snuggly attached, the knobs are recessed into the chassis and feel great, and the switches are very rugged. I would have no qualms about taking this unit on the road. It's compact as well, measuring 7” by 5.5” by 1.5” tall and only weighing about 2.5 lbs. 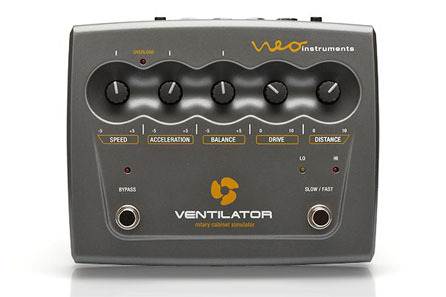 The Ventilator ships with a brick in-line power supply and a small but thorough manual. The controls are logically laid out and fairly self-explanatory. The five recessed knobs that grace the upper half of the unit (see Fig 1.0) are SPEED (- 5 to +5 ), ACCELERATION (- 5 to +5 ), BALANCE (- 5 to +5 ), DRIVE (0 to 10), and DISTANCE (0 to 10). A single LED sits in between the first two knobs to indicate when the input is overloaded. Underneath are three more LEDs; the leftmost signifies when the unit is bypassed, and the two on the right are marked LO (a yellow LED) and HIGH (a red LED). They represent the speed of each virtual rotor by fading in and out. Very cool! At the bottom of the unit are two momentary switches, BYPASS and SLOW / FAST. Both switches are easy to operate with either a foot or your finger and feel extremely satisfying to push. The back of the unit (see Fig 1.1) is graced by two pushbuttons, four 1/4” jacks, and the 12v DC power input. The leftmost pushbutton determines whether the pedal will be used with keyboards or with guitar: More on that in a bit. The other pushbutton changes the input gain, either LO or HI. The jacks, from left to right, are: REMOTE, OUT R / MONO, OUT L, and IN. "Alive & Kickin'!" available now! organissimo latest and the first live CD from the band!